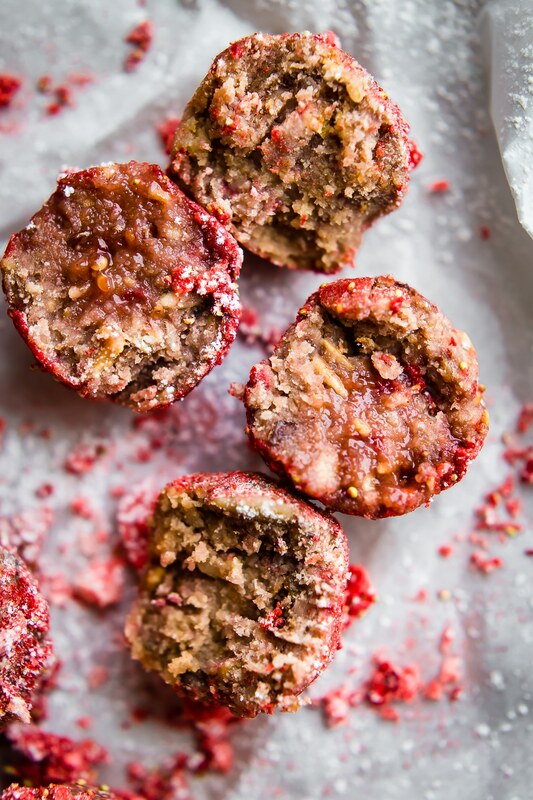 No Bake Strawberry Cake Bliss Bites are a bite size vegan dessert. This healthy treat has dried strawberries, cashew cream, gluten free granola/flour, and a sweet jam filling – Tart and tasty! 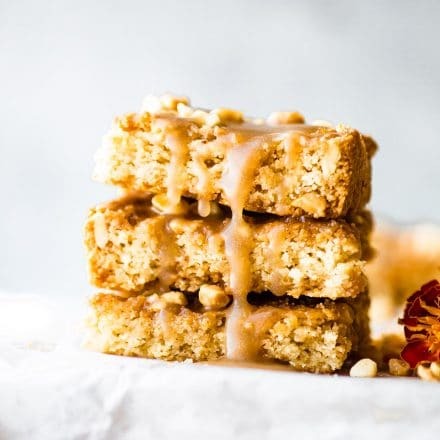 A vegan cake bite that requires no baking, just blissfully nourishing. Paleo friendly. Here I go again…. going Rogue today. An unplanned post. Ohhh and a bonus bite February! 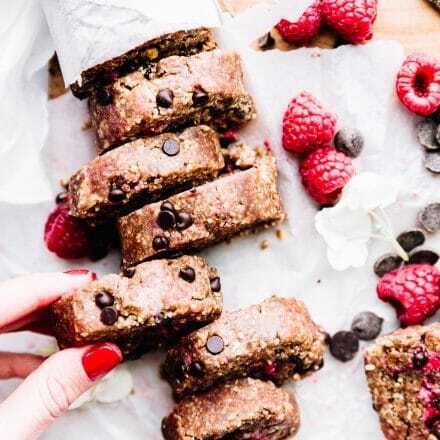 Yes another, no bake BLISSFUL cake (energy) bite recipe. 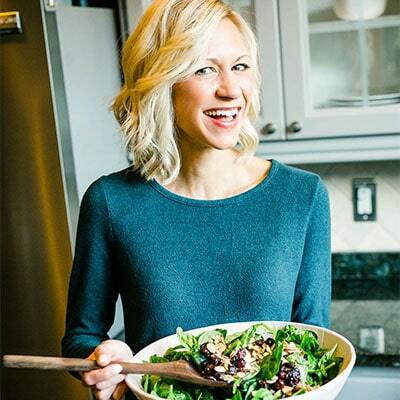 I thought February deserved extra love because one, I’ll “might” be taking a little break in March, so not sure if I can squeeze in more healthy bites recipes. Don’t quote me on that. And two, I totally missed the boat on all romantic things this year. Actually, scratch that, the Kiwi Cotter and I are probably the most unromantic people ever. So I’ve missed the boat for 9 years. Heck we didn’t even celebrate our anniversary this year. I think we are too tired. Maybe we bought a good wine. Ugh, I can’t remember. 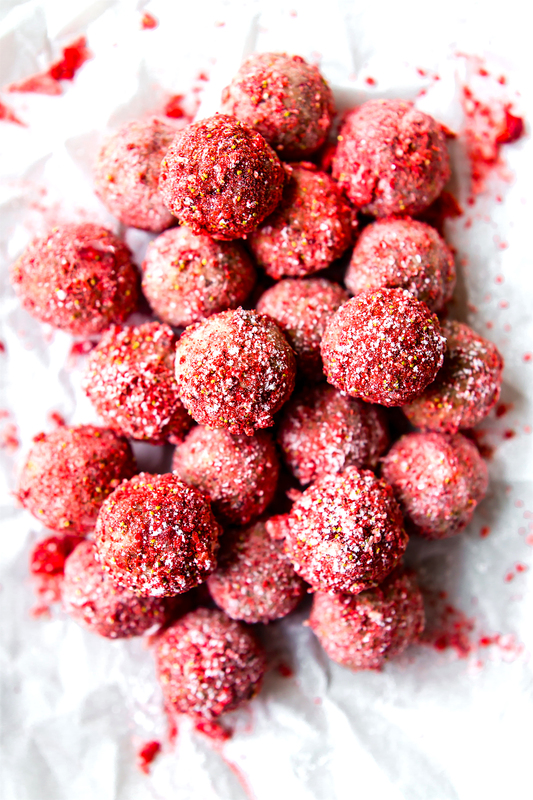 Anyways….. As I sit here sharing this no bake strawberry bliss bite recipe, I’m actually chomping down on one these with my coffee. Be jealous. Freeze-dried strawberries mixed with BLISSFUL granola and cashew cream are the perfect breakfast. And I plan on saving a few for next Wednesday. I mean Tuesday. I can never keep those exact Holiday days right. These no bake strawberry cake bliss bites are the perfect way to bring a little Valentine’s Day love into the month. Or anytime really, no really! What man/woman/kid doesn’t love strawberry cake in bites form? Vegan and gluten free of course. Oh and Paleo friendly if you use Blissful Eats Grain free Granola. Get it? 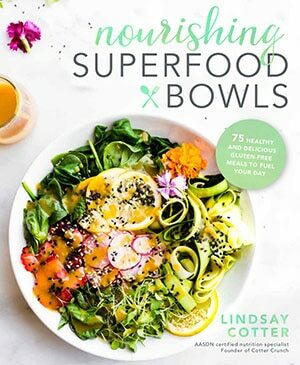 Bliss Bites? Haha! I swear I didn’t mean to label them as that, but it does make for a catchy pun name. I actually used half blissful bites maple granola and then a handful of another gluten free vanilla yogurt. Ya’ll so perfect for school functions and for kids/big kids with food allergies. You know, all of the above. 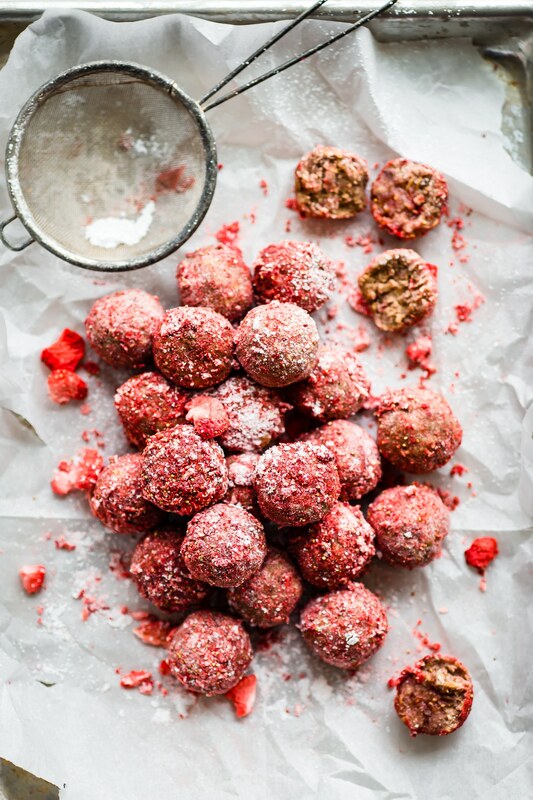 The other beauty about these no bake strawberry cake bliss bites (bites gone rogue) is that I made them with just leftover ingredients. Plus I so wanted to try using cashew cream for more than just frosting or vegan cream cheese. Luckily, I accomplished both in just one recipe. Thrifty and functional! 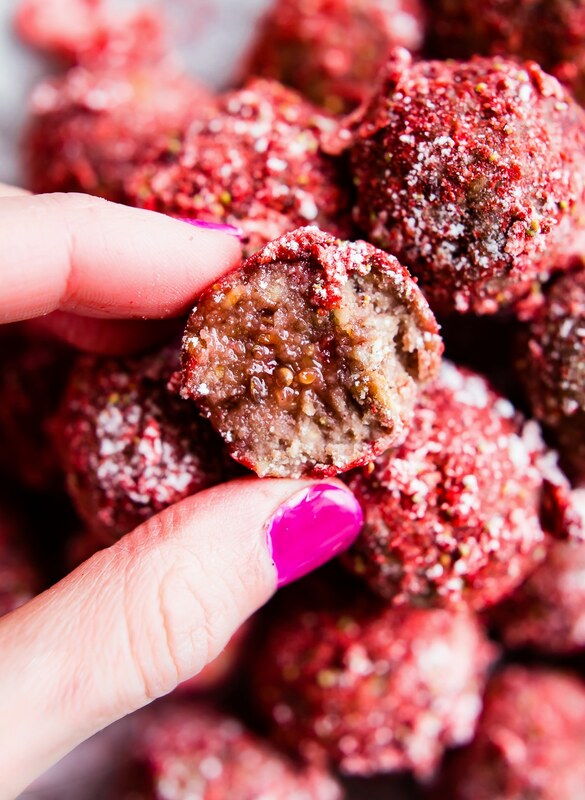 If you don’t have freeze-dried strawberries, you can easily use just dried fruit. 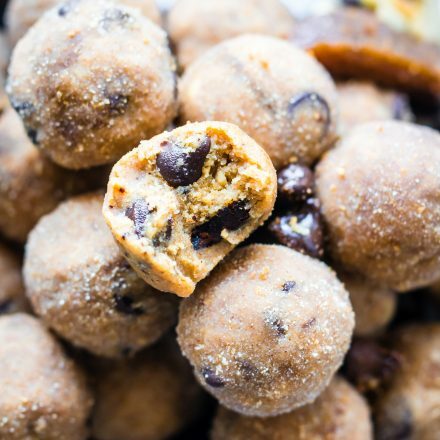 Just soak the cashews, add in the little ground granola, maple syrup , Almond flour or coconut flour, and one other secret feeling. Yeeeea baby! These bites are pretty much my jam, I mean our jam. Yep, strawberry jam. It’s what makes the filling of these strawberry cake part. Hollajah! The strawberry filling reminds me of my days where I was obsessed with strawberry shortcake. Not the actual cake, but the fictional character. Please tell me you remember her? Strawberry shortcake? I think I dressed up as her for Halloween five years in a row. I was all about her tall hat striped green socks. Anyways, I digress and am way off topic. As usual. 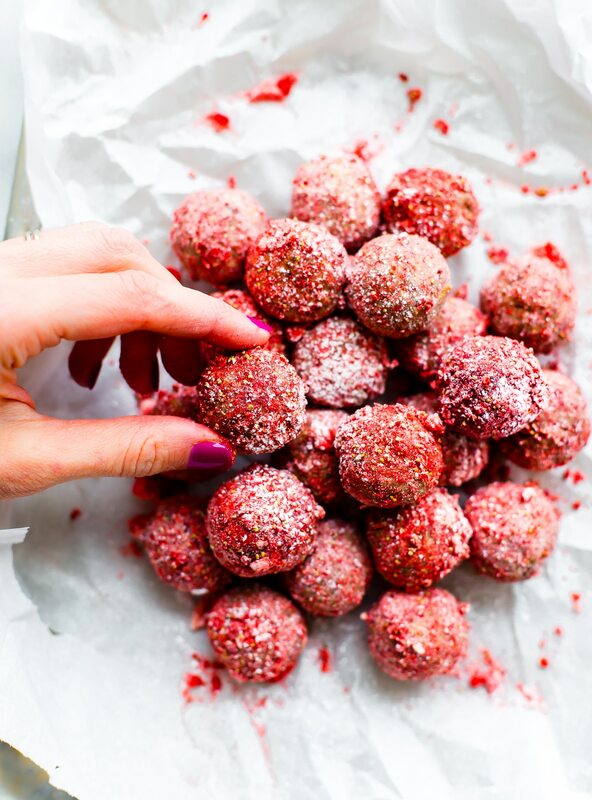 No Bake Strawberry Cake Bliss Bites are a bite size vegan dessert. This healthy treat has dried strawberries, cashew cream, gluten free granola/flour, and a sweet jam filling – Tart and tasty! First make your cashew cream. Soak the cashew in purified water for 2-4 hours or longer if you would like; up to 24 hrs. Next add water, vanilla, and a small amount of sweetener (maple syrup or coconut sugar) to food processor or blender. Blend until creamy. It might take a while to get the perfect creamy texture. Taste and see if it’s sweet enough to your liking. Add more sweetener and blend again if desired. Once you’ve made the cream, set it aside. Blend your strawberries until fine. Keep extra for rolling bites in batter. 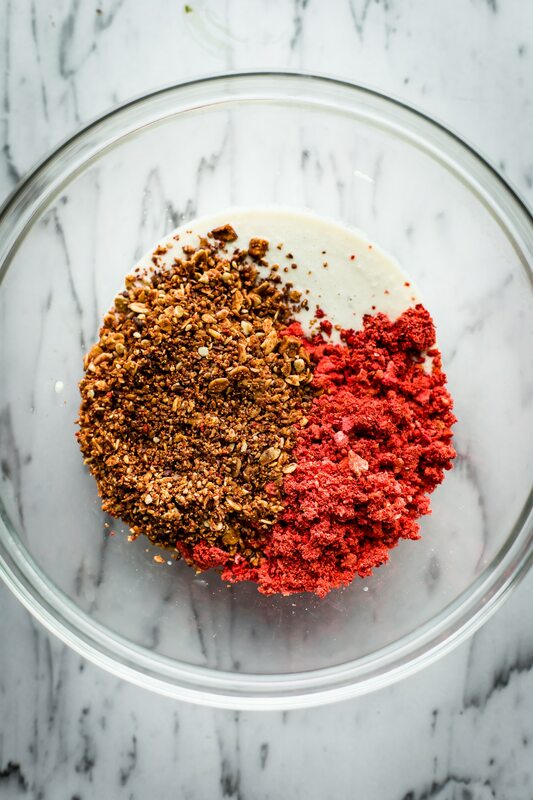 Blend your granola until a Flour/meal like texture is formed. Add 3/4 c granola, strawberries, and 1 cup or so of your cashew cream into a bowl. Mix together. Next add in your coconut flour, maple syrup, and extracts. This is where you need to see if the batter is too thin or thick. If too thin, add more granola or coconut flour. If it’s too dry, then try adding a bit more cashew cream. Roll into balls (a little smaller than golf ball size). Once you have the bites rolled, you can add in the jam filing. This is optional. Split the bites down the middle with a knife 3/4 way down; add a tsp or less of jam, then roll again. Repeat until each bite is filled. You can then roll the bites in extra strawberry that was ground up. Place on tray and put in freezer to chill for 30 minutes and set. Remove, sprinkle with powdered sugar. Store in fridge or freezer until ready to eat. Up to 6 weeks. 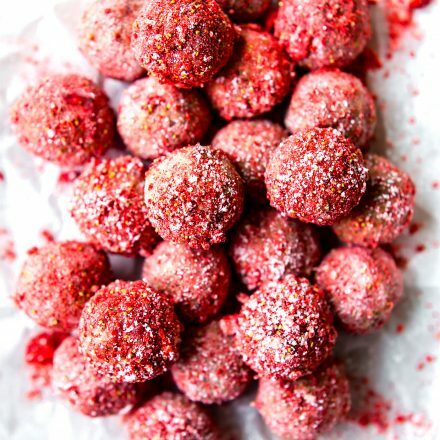 If you don’t have freeze dried strawberries you can use dried fruit, but texture will be stickier and you might need more coconut flour. 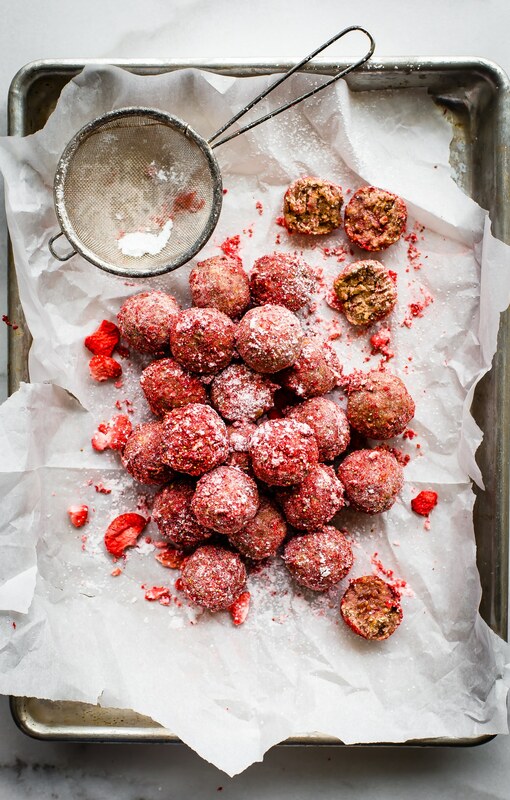 Hey, if you’re stuck indoors this weekend, like most of the East Coast, you probably have time (and ingredients) to whip up Blissful Berry cake bites! Just sayin..
We plan on not being sick this weekend or working! Wish us luck! And that will prelude a romantic weekend. Mwahaha ha ha ha. ..
What are you going to do for Valentines day? Share something… BLISSFUL! 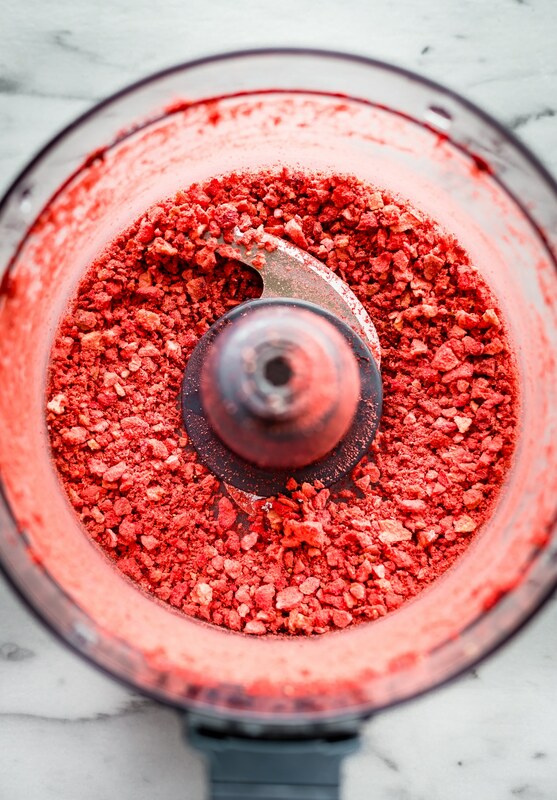 P.S favorite way to use cashew cream or freeze dried strawberries? I would love more ideas. No romance going on here either. Maybe I did inmake these a magical man will show up at my door? Haha…one can always wish right? Yummm. I love freeze dried strawberries! I think you should totally take a break (If you think that you need to) and get your bearings up there. Maybe go frolic a bit. You deserve it! yes! we plan on a spring break staycation! frolicking away! Sorry, but if someone didn’t grow up knowing (or loving) the Strawberry Shortcake series/cartoon character as a kid, then I pity him/her, haha. And I LOVE these luscious bliss bites! Oh i know you’d love Tara! You had ne at the chasew cream. And the color of these. They looks amazing. Also, love the nails. We’re roasting a whole pig here tomorrow for friends Birthday. I haven’t been thought about Valentine’s! Gulp. haha, i like pig. Shall i come with bliss balls? Yes. See you at 6! You definitely deserve a warm vacation after all of the snow that you’ve seen in the past few weeks! And these bites do look blissful. OMG — my strawberry-loving son would go crazy for them! OK, I never thought you would be the unromantic type AND YAHOO for a break in March. DO IT! now only if someone will make a batch for me! 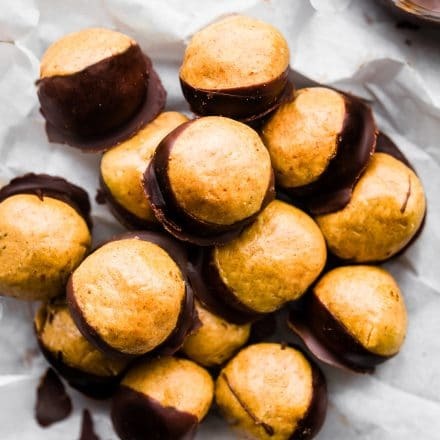 these look totally dreamy and delicious. Ooh, these do sound blissful. Where do you get butter extract? They sound like strawberry cake, for sure. :o) And I don’t think you have to do something romantic just one day out of the year. It’s kind of a year round sort of thing; love doesn’t have to be expressed on just one day. These look amazing! Unfortunately, I have.a food sensitivity to cashews. Anything you can suggest to replace the cashew cream? Thanks! This Strawberry Cake is so amazing, I Like Strawberry so yummi.